NEW YORK, NY--(Marketwired - June 13, 2017) - Not only does Lego dominate the box office, the theme park and the toy chest, it dominates consumer conversations taking place offline and online, according to a recent, first of its kind analysis. The top-selling toy brand earns the distinction of being a "Conversation Commander," ranking at number one among other brands in the category. A key driver of this distinction is the brand's exceptionally high offline sentiment score. 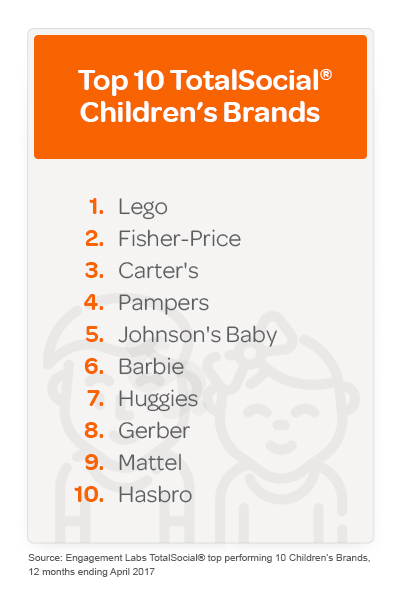 The findings were released by Engagement Labs as part of its TotalSocial® rankings on the top performing children's products brands in the U.S. The rankings are based on Engagement Labs' proprietary TotalSocial data, which continuously measures the most important drivers of brand performance with respect to social media and word of mouth conversations. "Overall, consumers are more likely to discuss children's products offline. Almost every brand showed stronger performance offline than online," says Ed Keller, CEO of Engagement Labs. "The two exceptions were Pampers, ranked fourth, and Barbie, ranked sixth, each of which had a slight advantage in online conversations versus offline. Given the large parenting community online, there is a tremendous opportunity for these brands to create campaigns that encourage social media conversations, to complement the offline conversations parents have." Toymaker Lego's ranking as the number one TotalSocial brand for the last 12 months coincided with a strong 2016, in which the company set a revenue record. In addition to its high sentiment score, Lego also has exceptionally strong online brand sharing for its category, indicating that consumers like to share branded content from Lego's social media pages. This also contributes to their number one ranking for online volume. "Lego's strong showing underscores how important it is for brands to understand what makes consumers talk offline versus what makes them talk online. The motivations that drive consumers to talk about brands face-to-face are quite different than the motivations that drive them to talk on social media," Keller says. "Only by knowing how a brand behaves in both channels can marketers optimize their performance. Lego clearly understands the dynamics of consumer conversations about their brand." Offline, Johnson's Baby has the highest volume score, which makes it the most talked-about brand, but it falls behind the leaders in the category because of its lower scores for online brand sharing and online performance among influencers. 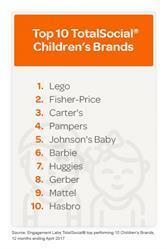 Gerber, which falls at number eight in the rankings, excels at online brand sharing, where it leads the category. However, it is missing an opportunity in offline brand sharing, where its position is completely reversed. In this dimension, it ranks last. To learn more about Engagement Labs or TotalSocial insights and how to increase your brand's word of mouth in real life and online, reach out at: totalsocial@engagementlabs.com. Learn more about brands like Lego that go against the grain in Engagement Labs' latest e-book, Lessons from the Leaders of Social Influence, available here. Engagement Labs (TSX VENTURE: EL) is the world's first TotalSocial™ company, offering intelligent data, analytics and insights for marketers. We are leaders in tracking, measuring and benchmarking the impact of conversations happening around a brand and industry – both online and offline. Consumer conversations are a proven driver of critical business outcomes, including sales. The patent pending TotalSocial data solution provides brands with unique insights and powerful analytics to understand online and offline social impact and drive business results. TotalSocial demonstrates to marketers how their online and offline conversation compare and contrast and helps identify areas of competitive opportunity or significant emerging threats. TotalSocial is an "always-on" proprietary scoring system, based on the most important drivers of brand performance: Volume, Sentiment, Brand Sharing and Influence. TotalSocial was built on the pillars of Engagement Labs' patented social media measurement tool and the world's only offline word of mouth tracking system for brands and tracks 500 brands within the U.S. across 17 major industry categories, and 350 brands in the UK.